Thailand's banking system is considered reliable and is generally safe to use. Nevertheless, it's always a good idea to keep your receipts and retain ATM slips. Opening a Thai bank can be frustrating as each branch may abide by a different set of rules. Some branches require work permits, others do not. If you need to open an account in Thailand and do not have a work permit or retirement visa, you may need to go to more than one bank. Despite what you may read or hear, it is possible to open a bank account here without a work permit (see below). 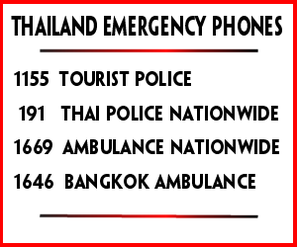 Depending on the location of the branch you visit, you may or may not need to speak Thai in order to accomplish your mission. Most branches have at least one or two people who speak decent English. When wiring money abroad, different banks have different requirements. One bank may requires an invoice as proof of where the funds are being sent, some may ask for an email or letter, while a printout of a website might satisfy the requirement of another. One of, if not the best bank in Thailand is Bangkok Bank. They are also the only bank to have their specific requirements for foreigners who wish to open a bank account in Thailand (see below). While each branch can still say they require a work permit, if you print out the information from their website (click here) and bring the required documents with you when opening an account, it is highly unlikely they will turn you down. For the record, I have accounts with six different banks. Half were opened without a work permit. Call our Customer Service Representatives at Bualuang Phone service on 1333 in Thailand or (66) 0-2645-5555 from overseas. The service is available 24 hours a day, seven days a week. A savings account can be opened with a minimum deposit of 500Bt. Interest is calculated daily and will be credited to your account every six months. Accounts which become dormant with a balance below 2,000Bt will attract a monthly service charge. When you open a savings account, you can opt to receive a handy Be1st Visa Debit card. You can use your card to withdraw cash, pay bills, or shop online or anywhere displaying the sign. The Be1st BTS card includes a stored value wallet for using on the Bangkok Sky Train. The Be1st Visa Debit Smart card is the first debit card in Thailand to use the latest EMV chip technology to keep your cash secure! This card can be used at Bangkok Bank ATM’s showing the Be1st Smart identification and online or at stores showing the sign. If you are a resident or are working in Thailand, with just a minimum deposit of 10,000Bt you can open a Bangkok Bank current account and be issued with personalized cheques. A monthly service charge may apply if the average balance is below 1,000Bt. To open a fixed deposit account with a range of deposit terms of up to three years, all you need is a minimum deposit of 2,000Bt. Please visit our latest deposit interest rates page to compare deposit rates. With a Foreign Currency Deposit (FCD) account, you can hold your funds in any of 14 currencies: USD, CNY, EUR, GBP, JPY, SGD, HKD, AUD, NZD, CHF, CAD, DKK, NOK, and SEK. This enables you to manage your foreign currency payments and income more effectively by minimizing risks from fluctuations in foreign currencies. FCD account can be a savings, fixed deposit or current account, needing an initial opening deposit of USD 1,000 or the equivalent. Please note, the foreign currency deposit account can only be opened at certain branches - click here to find your closest branch. You may also wish to view the Deposit and Withdrawal Fees, or other Conditions and Fees for the FCD account service. A non-Resident Baht account may be useful if you plan to transfer funds to Thailand for investment purposes and intend to repatriate your funds in the future. Transactions are recorded in accordance with Bank of Thailand regulations. Please note, this account is not appropriate for daily use as all transactions are manual and can only be made at the Head Office branch on Silom Road, Bangkok.